Are you in the process of selling your home? One of the ways you can make it more appealing to potential home buyers is by having travertine, saltillo, slate, flagstone, and other natural stone surfaces professionally cleaned. You’ll sell your home in no time when you clean your professional stone properly. Here’s how cleaning the stone will benefit you. It’ll restore the color of your natural stone. When a natural stone surface is first installed, it shines bright. Nevertheless, over time, the color of natural stone can become dull, especially if it’s located in a high-traffic area. When you have natural stone professionally cleaned, it’ll bring the color of it back to life. It’ll also restore the grout in between the stone. Your flooring will look like new again when you have it cleaned by the pros. It’ll make the rest of any room look significantly better. Professionally cleaning your natural stone floors will do more than just make your flooring look better. It’ll also bring up the visual appeal of the entire room that the flooring is in. You might not think that people pay much attention to a floor, but it’s one of the first things they’ll notice when you have it cleaned. It’ll make a great first impression and give an entire room a much-needed boost. It’ll show that you go to great lengths to keep your home clean. When people see that you’ve had a natural stone floor professionally cleaned, it’ll reflect well on your entire home. 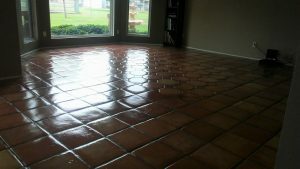 If you have your floors cleaned, people will assume you also have all the other areas of your home cleaned. Maybe you do have the pros clean your home, maybe you don’t. Either way, your natural stone flooring will give off the impression that cleanliness is important to you. It’ll make your home more desirable to others. Let Horizon Carpet, Upholstery, Tile & Grout Cleaners show you how clean we can get your natural stone surfaces. Call us at 602-404-8064 or 623-561-6277 today to schedule natural stone cleaning.